Birds Returning, Returning Birds | Let's Live Forever! 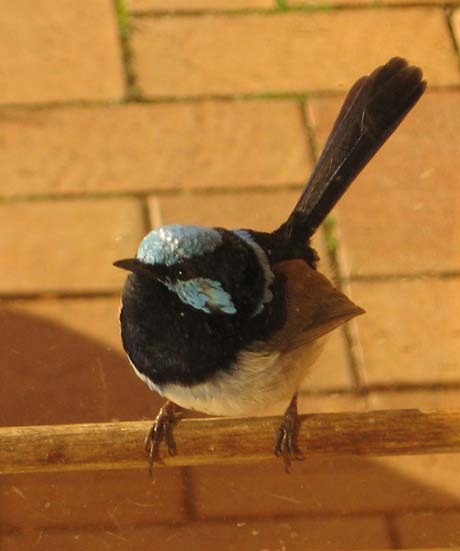 The blue one has only just turned blue, and as for the brown one, we don’t know whether it is a female or a younger male getting very excited and territorial at the sight of himself. Whatever is going on, it is very entertaining. They squeak and fluster at themselves and each other, and constantly hop over each other. Which makes it difficult to photograph them—as soon as I focus the digital camera they hop, and then I get a blur of feathers. With the one-way window I can get right up close—I can see them but they can’t see me! 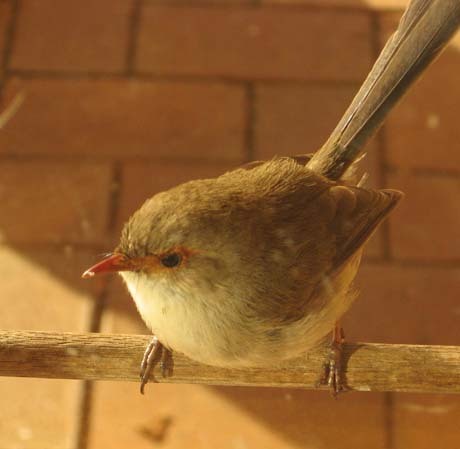 They are there from dawn to dusk, and I have been seeing them because I have been at Mum’s house a fair bit lately. I am going back up there tomorrow for another week or so (it’s about a 2 hour drive away). 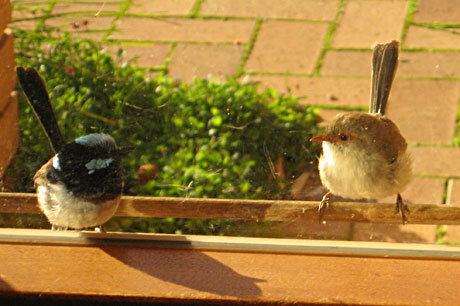 No doubt I won’t be able to resist taking a few more photos of blue wrens. * * * Have you read Return of the Bird Tribes , by Ken Carey? I love this book. It is one of those books that move you into a higher space when you read it—it has stories illustrating Native American spirituality and shows clearly that we are much more than beings designed to live a relatively short life that has a less-than-glorious end. Whether or not you consider yourself to be interested in “spiritual” matters, I think this book could speak to you, as long as you can find the time to sink into it. To those of you who know you are definitely into things spiritual, and perhaps wonder at how one can reconcile physical immortality with knowing we are “more than just this body”, this is a book I would highly recommend. If you would like to know more, a look through the reviews on the book’s Amazon page, here , could help you out. Love Native American stuff usually. I’ll put it on the list. .-= Tom Volkar / Delightful Work´s last blog ..Ripening Bliss =-. Hi Robin. I LOVE birds and these pictures are terrific. I’m jealous that you get to be real close to them and they can’t see you. Those blurry shots are interesting nevertheless; very abstract. 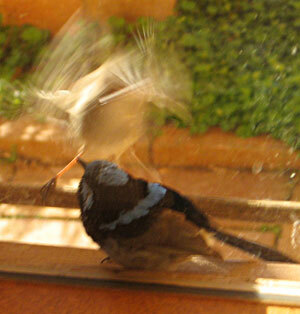 I once put gloves on and caught a baby starlit jay when it got trapped on my balcony. It’s poor little heart was beating a mile a minute. I wished I could have made it understand that I wasn’t going to hurt it. At any rate, I let it go and it flew away happily. .-= Davina´s last blog ..Social Media? Go Ahead, Fly Your Freak Flag =-. Very cute little guys! I like the “action shots” with the blur of movement. I love birds anyway, and it’s so nice you can get up close to them. I agree with Tom that they’re probably thinking they see another bird challenging their territory. My dogs certainly seemed to react that way to mirrors. Adding that book to my list. It sounds interesting. .-= Dot´s last blog ..Comment on Auntie Meme by Dot =-. Hi Robin: That book on Native American Spirituality looks excellent. Christmas is coming soon and I’m going to ask Santa for lots of books. 🙂 And those birds are really cute. .-= Marelisa´s last blog ..The Key to Success: Resourcefulness (Creativity + Determination) =-. Great pics, Robin — makes me want a mirrored window! And the book recommendation? How fortuitous, since in four short weeks I’ll be heading out with my daughter for a six-month rv trip exploring the southwest. I’m no authority on American Indian Spirituality but what I’ve read I really connect to. I just ordered the book, thanks for sharing! Such cool photos…a moment in time. If we’re not present we’ll miss them… thanks for sharing they made me smile. I’ve not read one of Ken Carey’s books in a long time. Looks good! .-= Tess The Bold Life´s last blog ..Did You Know? =-. I love watching birds and your pictures are great. For some reason, very small finches are all over my old apple tree this week – maybe traveling south, but I have never seen this gray toned bird before. Maybe 50 in the tree at a time and at the feeder. I did not like that they left there mark on all the clean towels on the line and I had to wash them all again. Eliza has an interesting post about mother’s and daughters on silver and grace…did you see it? .-= Patricia´s last blog ..Sand In the City 2009 =-. @Tom – Good Heavens – you had to go to a lot of trouble! @Davina – thanks D – I know what you mean about wanting to reassure them – we rescued a lorikeet that slammed into the house (they fly like maniacs), and felt the same. @Dot – thanks about the action shots! Yes – it would definitely be a territorial thing – so therefore not sure whether the brown one is a male or female (we don’t know whether they are flirting or fighting). @Jeanne – yes the mirrored window was in the house when we bought it – we woudn’t have thought of putting one there. Glad you bought the book! – it has been the only Native American thing I have read – it is a bit different! @Patricia – Well it must be interesting to have a new type of bird to observe, and not so interesting to have to wash all the towels again! Thanks about the pics! The book sounds like something I would very much be into! You know though, thanks to so much amazing material out there coming through and from so many places, I wonder if there will ever be a day where I have nothing to read and I actually seek out a new book. So far, so much amazing material has just been literally “falling into my lap”. And I am very grateful for that – always. Great photos! They are so cute. I can imagine how entertaining it must be to watch them. .-= Vered – Blogger for Hire´s last blog ..Visiting Vancouver =-. Great photos! Nature is wonderful! .-= Mark´s last blog ..Please Lie To Me! =-. Thanks for the recommendation — Ken definitely has positive and inspiring messages in his books. I like how you took actual photos of the birds and relate it to the book that you are recommending. The birds look lovely! And the book sounds awesome! .-= Evelyn Lim´s last blog ..Create Powerfully In Pictures =-. Better than TV, that’s for sure. I enjoy watching nature from my deck: deer, hawks, squirrels. .-= Mike Foster´s last blog ..Plum Crazy! =-. @Evita – Hi Evita – aren’t they! I’m now back at Mum’s and I’ve hardly seen them – just as well I took the photos when I did. There are SO many tantalising books, aren’t there? @Vered – thanks! – they are! – they are tiny, you know. @Mark – hi there Mark – it certainly is. @Chris – have you read some of his others? @Evelyn – it “came” to me. They are so cute! I’m sold! Would love to read it. Great photos. Like you, I also enjoy bird watching. .-= Barbara Swafford´s last blog ..It’s About Time =-. Beautiful shots of the birds! .-= Mama Zen´s last blog ..Bottled Water And An Air Kiss? =-. Love the pictures, Birds are my favorite as you know, stunning, they fly, walk, swim, and make the most amazing sounds from such a small body. The one way glass @ your mums is a real bonus. @Jannie – Jannie, you are back! 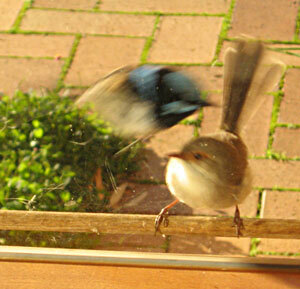 Yeah – we think they are competing, not flirting. Sigh. @Barbara – hi Barbara – do you think there is a pecking order of bloggers?